I hope this will be my one and only commentary on the U.S. presidential election. 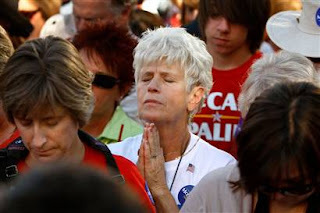 I saw this article about supporters of the candidates gathering to pray for success on election day. No surprises here. Steve Strang, publisher of Charisma, a popular Pentecostal magazine, asked his many readers in an e-mail to pray, fast and "believe for a miracle to see John McCain get elected." But many pastors are warning against asking God for a specific outcome. The Rev. Adam Hamilton, senior pastor of the 12,000-member United Methodist Church of the Resurrection in Leawood, Kan., has urging his congregants simply to pray for help choosing the right leader for the country.... Hamilton said no one knows "who God's person for the hour is." That's right, whoever wins, some god did it. Completely unfalsifiable, typical religious style. The hourly prayers begin with repenting personal sin and include appeals for "candidates to adopt biblical positions on issues" and remember they are accountable to God. Yes, we need that Biblical law! The candidates should be for the stoning of disobedient children, killing people for spilling their seed on the ground, offering your daughter up to get gang-raped, etc. Or did they mean New Testament stuff? Like they want the leader to turn the other cheek when the country is attacked, or to take from the rich and feed the poor?